I keep getting an error message saying that one of my browsers is still open when it's not? When Dashlane is first launched, it installs extensions in your browsers so that your data can be auto-filled while browsing. If you only delete the Dashlane application, the extensions and some items may remain on your computer. This is why we recommend to follow these steps to make sure that all traces of Dashlane are removed from your computer. Open the Dashlane application and select Help → Uninstall Dashlane… in the menu bar at the top of the screen. This will open a new window. 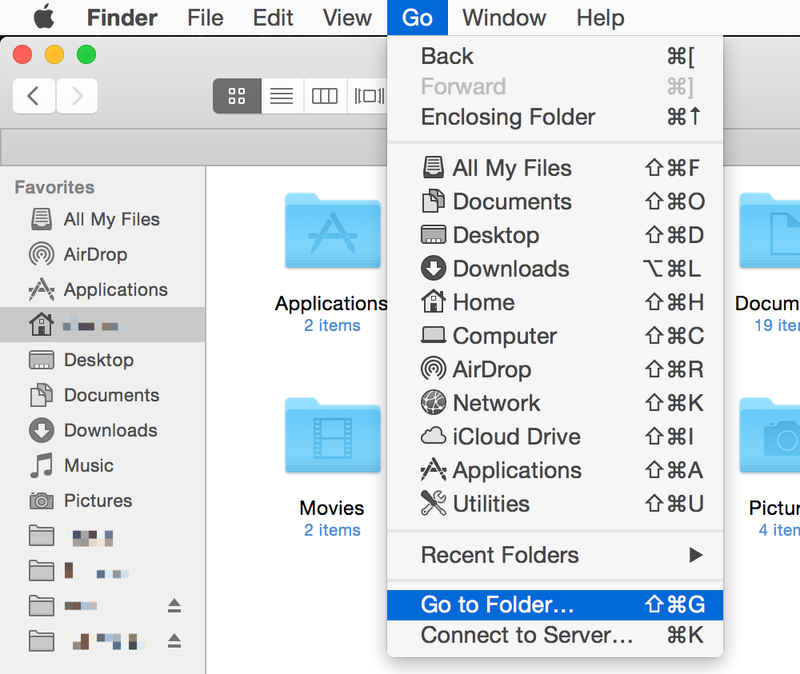 If you cannot do this because you do not see this menu in the Dashlane application, it means that you have installed Dashlane from the Mac App Store and not from our site. Click here to see how to uninstall the Mac App Store version. If you cannot do this because you do not have the Dashlane application anymore on your computer, click here to download Dashlane from our site and install it again. in that folder, open the application named Uninstall Dashlane.app. This will open a new window. Now if you wish to have all your data for Dashlane deleted from this computer, check the box there. If you check this box, all your credentials and passwords, secure notes and personal information will be deleted from this computer. If your Sync is enabled (which requires a Premium account), your data will still be saved encrypted on our servers and will be restored the next time you install Dashlane. If your Sync is disabled or if you have a Free account (without Sync), your data will be permanently lost if you delete them from your computer. When you are ready, click Uninstall. If you used Dashlane in Safari, you may need to uninstall the extension manually. To do this, open Safari, then select Safari → Preferences in the menu bar at the top of the screen and then go to the Extensions panel. Lastly, select Dashlane in the list and click on Uninstall. If the extension for Dashlane is still in your Chrome toolbar, you may need to uninstall the extension manually. To do this, open Chrome, then select Window → Extensions in the menu bar at the top of the screen. Lastly, click on the trash in icon next to Dashlane in the list to uninstall it. Click here if you want to download Dashlane again from our site. Open the Dashlane application and select Dashlane → Manage browser extensions… in the menu bar at the top of the screen. A new window will open. Deselect all the browsers on that window and click Install to validate. This will remove the Dashlane extensions from all your browsers. Then go to your /Applications folder on your hard drive and move Dashlane to the Trash. Restart your computer to make sure all processes are stopped and empty your Trash. 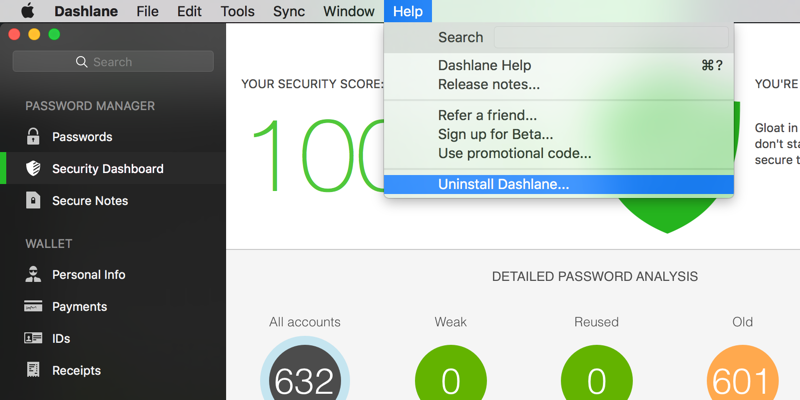 Click here if you want to download Dashlane again from the Mac App Store. To remove Dashlane from your computer, go to your Control Panel and then to the Uninstall a program section. From there, you can uninstall Dashlane by double-clicking on it in the list of programs. The confirmation window (see below) will then ask you if you also want to delete all your personal data on that computer. 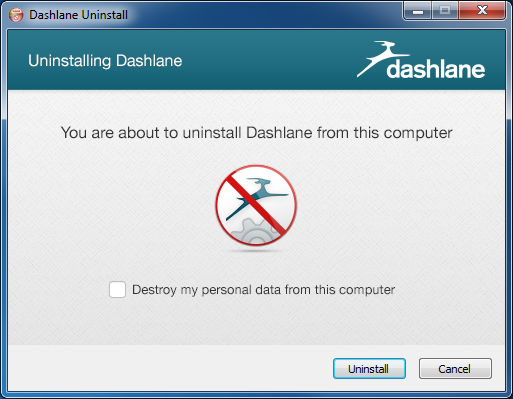 If you wish to have all your data for Dashlane deleted from this computer, check the box there. If you check this box, all your credentials and passwords, secure notes and personal information will be deleted from this computer. Alternatively, you can go in your Start menu, then to the All Programs menu, find the Dashlane folder and click on Uninstaller from there. This may happen for browsers who use many background processes, which still run after you close all windows. You can try restarting your computer and uninstall Dashlane immediately, before opening any browsers. Note that when deleting Dashlane from your iOS device, all your data, passwords, secure notes will be deleted at the same time. If you have a Free account (without sync) or if you disabled sync on your devices, do not delete the app from your iOS device. You would lose all your account data forever. Click here for more information and see how to check your data is synced before deleting Dashlane from your iOS device. Click here if you want to download Dashlane again from the App Store. Note that when deleting Dashlane from your Android device, all your data, passwords, secure notes will be deleted at the same time. If you have a Free account (without Sync) or if you disabled Sync for Dashlane, this means that you will lose all your data forever. Navigate to your device Settings. 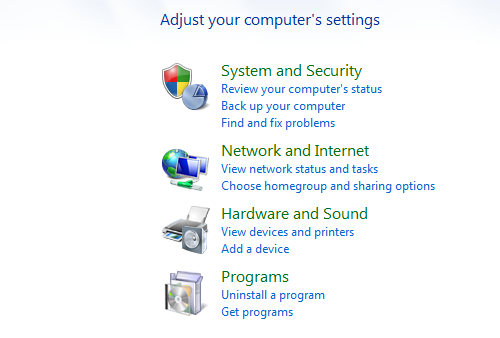 In the settings menu, you will see a listing of all the settings that you can change. Select Applications or Apps in the list. In the menu to manage your applications, you will see a list of all your installed applications. A screen will appear that will give some details about the app, including how much storage the app consumes, how much of information is stored in your cache file and any default launch settings. Press the Uninstall button here. This will begin to delete the app from your device. Click here if you want to download Dashlane again from the Google Play Store.